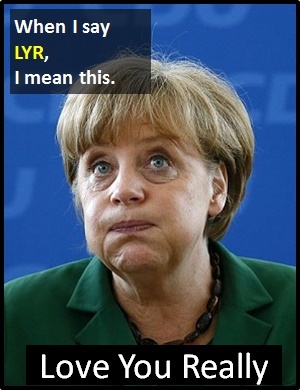 LYR | What Does LYR Mean? LYR means "Love You Really". The abbreviation LYR is a humorous way of reassuring someone that you really do care about them, even though your actions may indicate otherwise. The abbreviation LYR usually has very little to do with actual love, but does imply a level of fondness and a close, friendly relationship. The use of the abbreviation LYR in text messaging is usually only appropriate between close friends or family members and very close colleagues. Dave: Pete! I can't believe you drank all the milk and didn't tell me! Pete: Sorry mate, I forgot. You know I LYR. Dave: Hi Carol, I need you to come in early tomorrow. Carol: OK boss. Sometimes I think that I might as well live in that office. Dave: Sorry to have to ask. You know I LYR. LYR is an initialism abbreviation. Technically, this means it is pronounced using its individual letters (i.e., Ell Why Arr), but as this is harder to say than "Love You Really", it is not often uttered using its letters. In other words, the abbreviation LYR is for efficiency in writing and not efficiency in speech. Before the digital era, we might have just said something like "Love You Really" instead of using the abbreviation LYR.